For all my drawings, I use a mechanical pencil 0.5 or 0.7 filled with 2B lead (this eliminates the need for constant sharpening) an assortment of erasers including a putty rubber and a large soft brush to wipe away any erasure debris. For blending and pulling out the colour I use soft tissue paper and rolled paper tortillons. The first thing we have to do is transfer the basic information from the photograph to the drawing paper, this is done by "gridding up", a network of accurately drawn squares either drawn directly onto the photograph or, as I do, a clear acetate with the grid drawn on, laid over and secured, to prevent moving. This grid now has to be repeated, very lightly and very carefully, on the drawing paper. 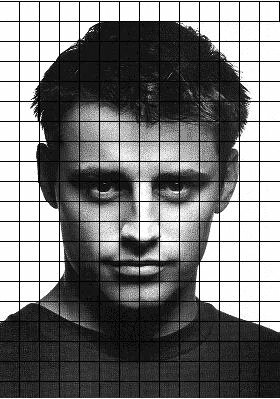 This grid will be erased so it's best to draw only the squares we actually need, in this case 12 across by 20 down. Place the grid centrally on the page. At this stage we can also decide on the scale we wish to reproduce the image, by enlarging the size of the grid, we can enlarge the size of the finished drawing.